Bird watching has long been a pastime of mine. Their songs always let me know spring is here, even though it may not feel like it. It is also fun to watch how the birds interact at the feeders and with each other. I have seen birds courting each other with elaborate dances. I have learned that some birds are nest robbers and bad parents--dropping their eggs and flying off into the sunset. One thing that thrills any bird watcher is spying a new bird, especially in their backyard. 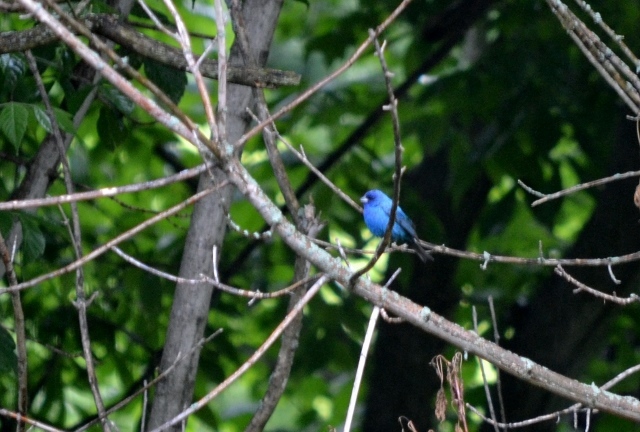 Over the past couple weeks I have spied an Indigo Bunting in my past yard, and today, managed to get a decent photo. Although this is not my first sighting of this bird, seeing one in my backyard is quite unusual, and needless to say, I am thrilled to have this beautiful bird visit and hope he stays all summer.